You don’t need to hire a professional team to renovate your home. I mean you could if you have the money for that sort of thing, but if you’re not ready to shell out the cash, you can accomplish a lot with your own two hands. Keep reading to get inspired. There are so many ways you can make your home look so much better that doesn’t require too much time or DIY skills. A fresh coat of paint never hurt anybody. 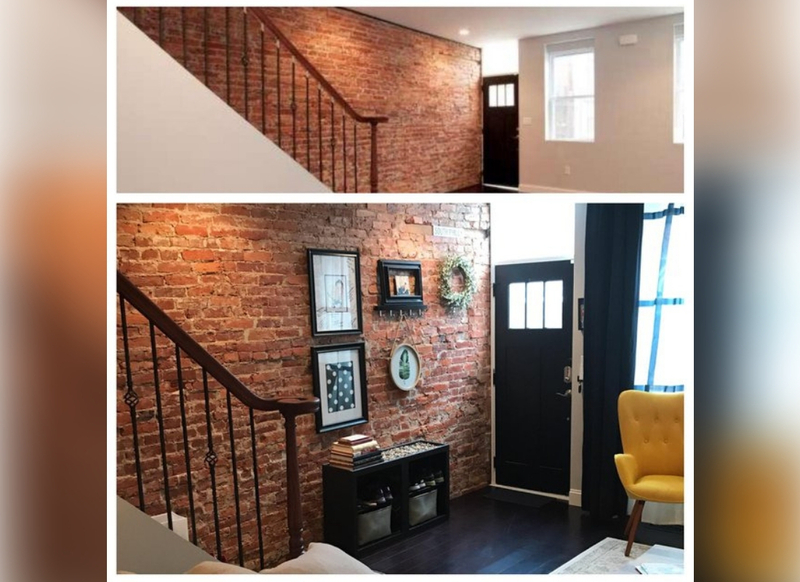 This amateur interior designer decided to spruce up a boring brick wall with some framed art, a solid piece of furniture, and a bright yellow chair. Now this entryway is way more inviting. Now, this looks like a house I want to live in as opposed to a hallway I want to walk right through. Little details really do make a world of difference. You don’t need to do much to really upgrade a space. 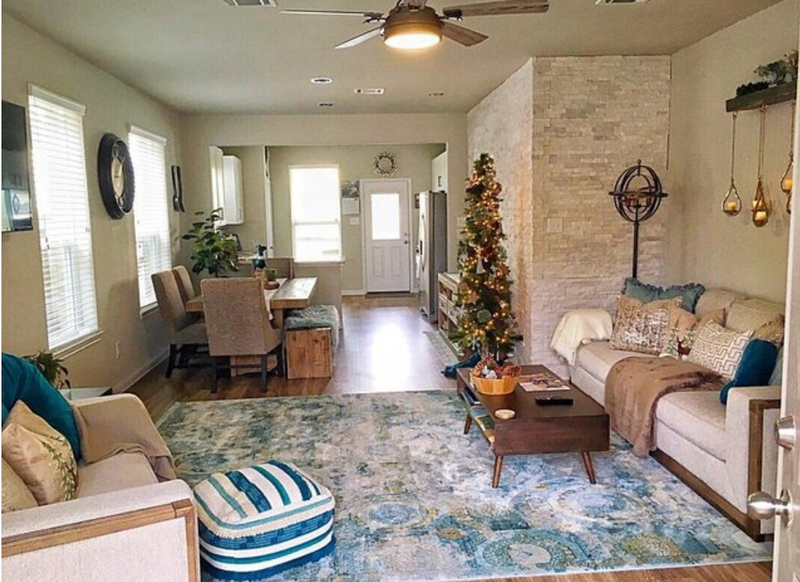 You can always bring your personality into a home, even if the bare bones don’t seem like they’re totally “you.” Just add some funky rugs, an odd colored coach, and some artwork that speaks to you. I’m sure most if not all of these items were found at a thrift store. If you’re going for the vintage look, don’t forget about thrift stores and second-hand shops. You can find so many great deals and your home will have a more authentic vibe. This space has a bohemian aura to it, but it’s also very clean and organized. I love that tan colored couch and how it sort of matches the wood coffee table. The picture on the TV is giving the whole room a reddish glow that perfectly mirrors that painting on the far wall. 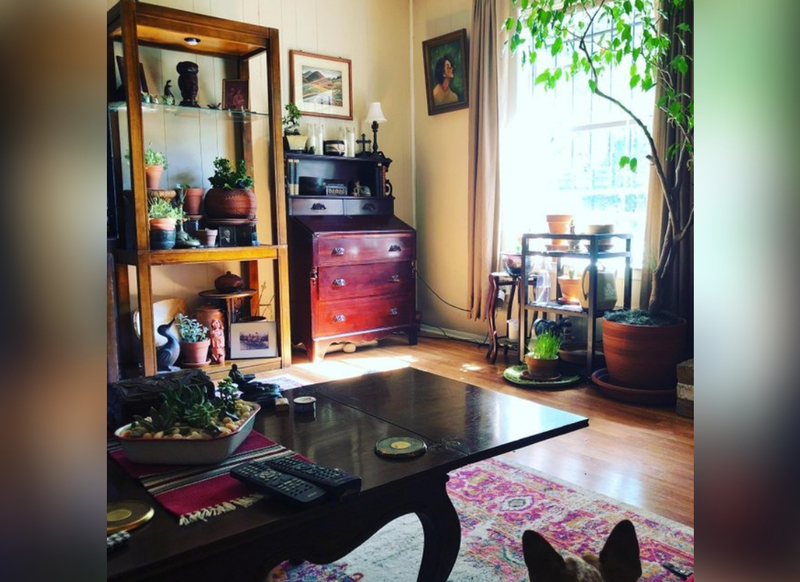 Although I love all the plants, the best part of this room is definitely the little Boston terrier just chilling. 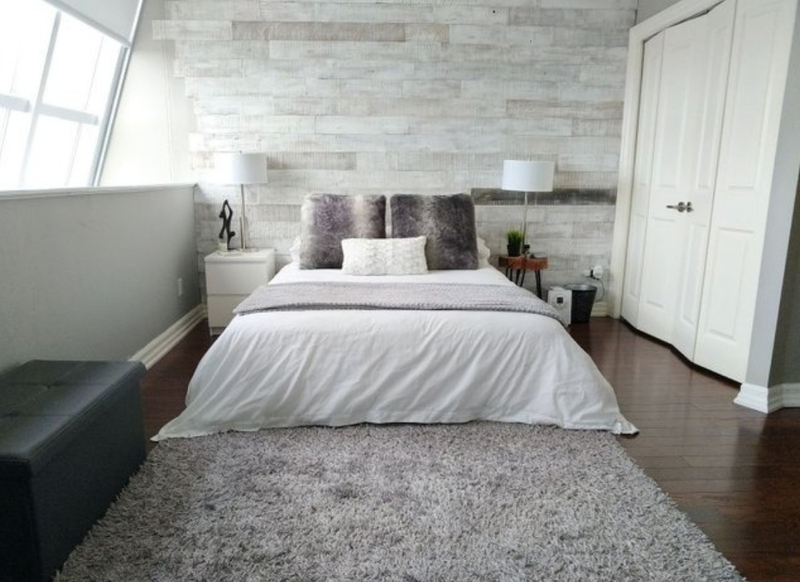 A great way to add visual interest to a room is by incorporating a lot of different textures. The wood cabinet and hardwood floors are strong and sturdy while the fabric couch, plush rug, blue velvet footstool, and puffy cushions all add some much-needed softness. The sign above the blanket ladder says “good vibes,” and this room is definitely full of good vibes. Can I just live here forever? 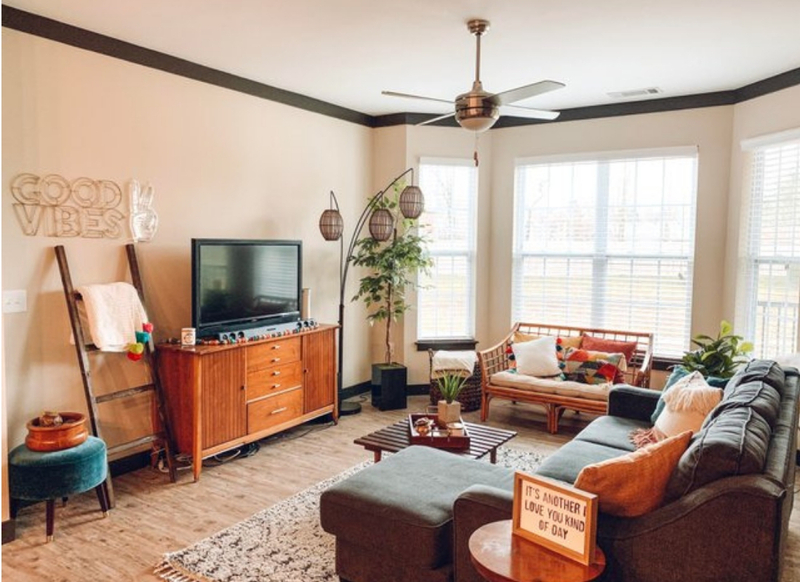 The amateur designer who put this room together was able to perfectly blend a whole bunch of different pieces and objects into one cohesive whole. Everything in this room looks like it’s been chosen and positioned with purpose. Even though nothing really matches, everything goes together to create a cool collector vibe. I love that giant tree by the window, and of course, the two little dog ears poking up from the bottom of the photo. The blue and beige colors in this room remind me so much of a sandy beach. If I ever make so much money that I can afford a beach house, this is exactly how I would want my beach house to look. I love the early modern feel of that coffee table. If I were designing this room, I would choose some early modern couches as well, but to each their own I guess. The key to a good gallery wall is variety. I mean, I guess you could get a bunch of frames in the same color if you’re going for something more uniform, but I like gallery walls that seamlessly combine a whole bunch of disparate pictures, paintings, objects, and frames. 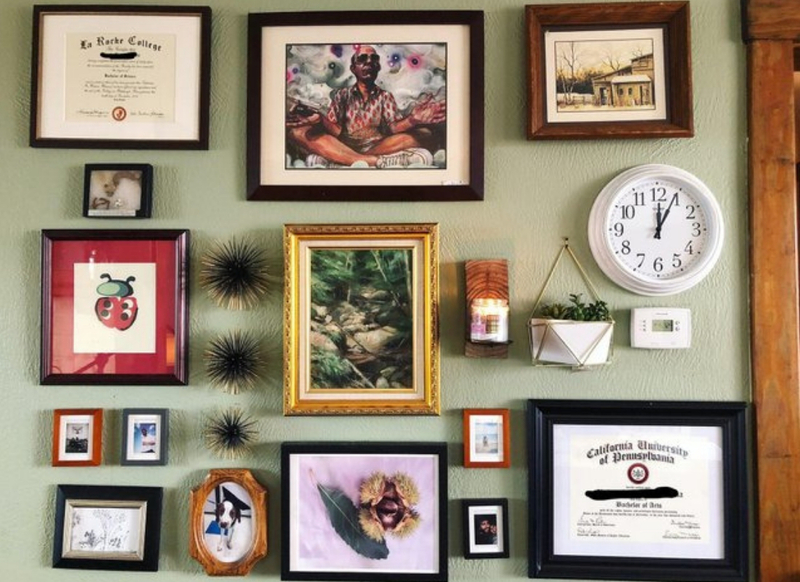 This gallery wall accomplishes that goal beautifully. The tiny frames are a great way to fill in small spaces, and that gold frame in the middle creates a clear, anchored center. Who Else Is In Love With Spanish Tile? I’ve been seeing Spanish tile on Instagram and on Pinterest a lot recently, so it must be some kind of new trend. There are some design trends that just don’t jive with me, but Spanish tile is definitely a trend I can get behind. I’ve seen Spanish tile backsplashes and Spanish tile floors and steps, but I’ve never seen it around a bathroom window. I also love those little rabbit figurines. Very cute. 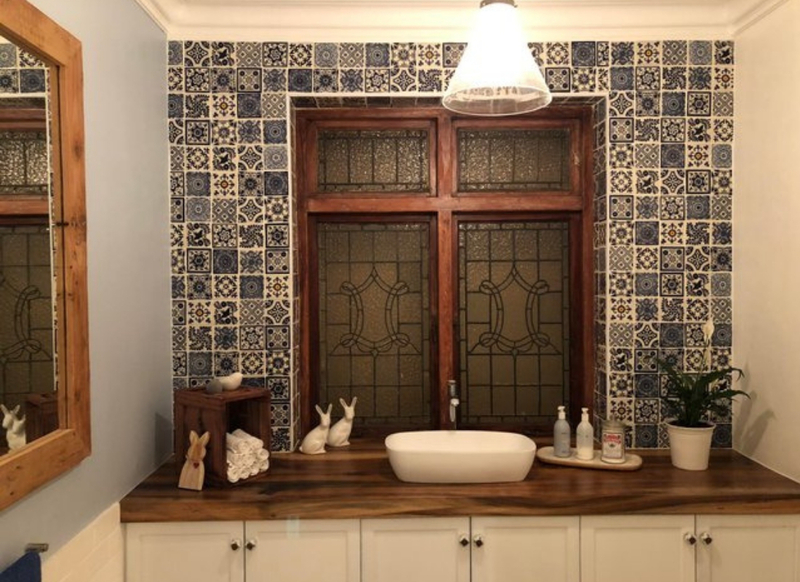 If you want to bring some cool patterns into your bathroom, but if you’re not so keen on Spanish tiles, you could always use wallpaper to get the job done. A tip for using wallpaper: wainscoting can really help a bold pattern look less overwhelming. This red wallpaper is pretty loud, but because it only starts halfway up the wall, it doesn’t overwhelm the whole room. 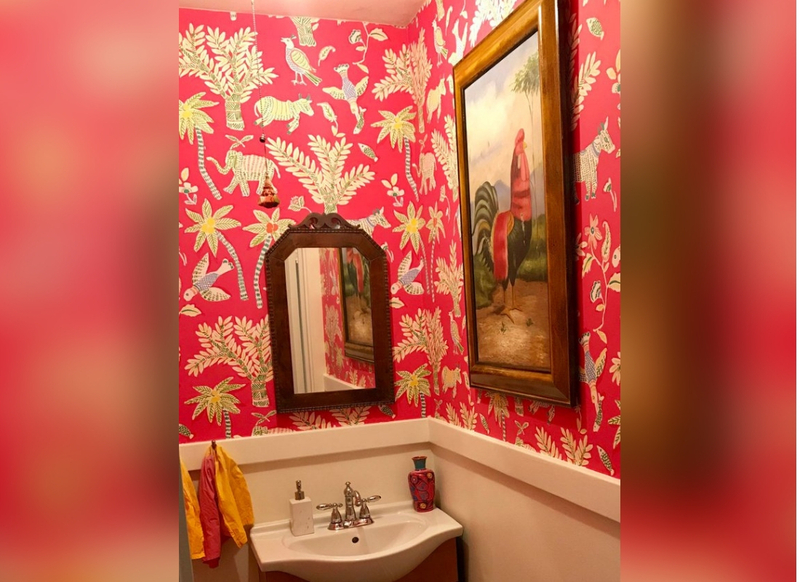 I love how the rooster painting brings out the color and pattern of the wallpaper print. This is a fairly simple living room. It looks like it could be the set of a show like Modern Family or something. It’s clean and cohesive and serene— a perfect room to unwind in after a long day of hard work. The candles and the fireplace add a lovely warm glow. Now I want to go out and buy about a hundred candles so I can have the same warm feeling in my home. 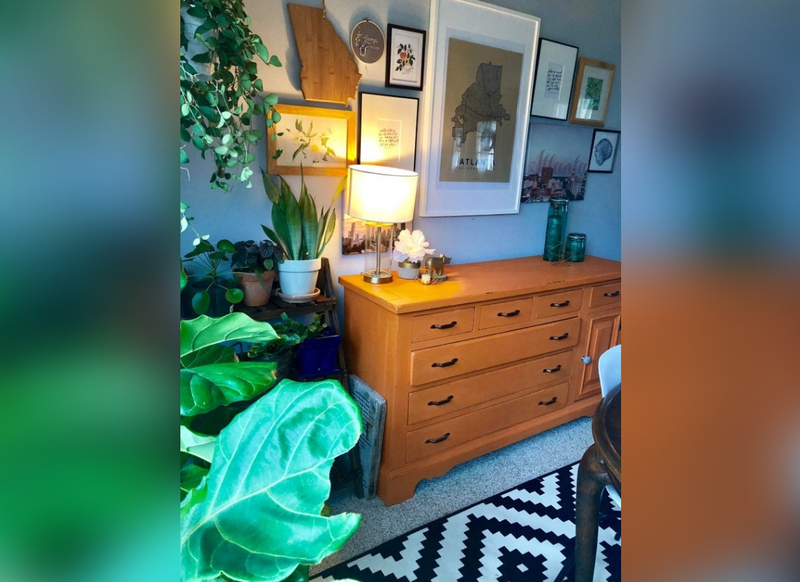 Everything in this room (including the plants) was found in a thrift shop. Blue walls aren’t really my thing, but after seeing this photo I feel like it’s completely possible to make blue walls work. That yellow chair is the perfect accent piece and the gallery wall that actually spans two walls makes the whole room feel personal and inviting. Of course, the plants add some much needed green space. If you’re not decorating with plants, you need to get on this trend asap. We can’t really talk about home decor without talking about Christmas home decor. Christmas is the time of year when you can really flex your decorating muscles. 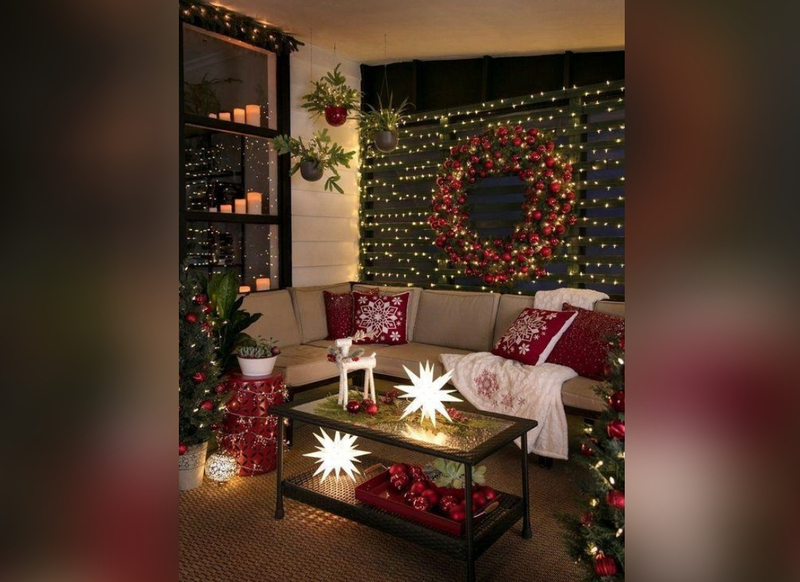 This amateur designer has gone all out with lights, trees, a giant wreath, candles, accents, and some festive pillows. I just want to sit on that couch under that cozy white blanket, sip hot chocolate, and watch a whole bunch of Christmas movies. I love how rustic this room looks. Every piece of furniture and decor in the room feels like it belongs there. Even though nothing really matches, everything is contributing to the amateur designer’s vision. See, you don’t need a fancy degree to make your room look nice. All you need is a few good hours on Pinterest and an idea that you can realistically execute. I love the floral footstool in the room, as well as the gallery wall way at the back. This design could be perfect for a kid’s room, a teen’s room, or an adult woman’s room. It’s definitely pink, girly, and fun, but it’s sophisticated enough to work for ladies of all ages. 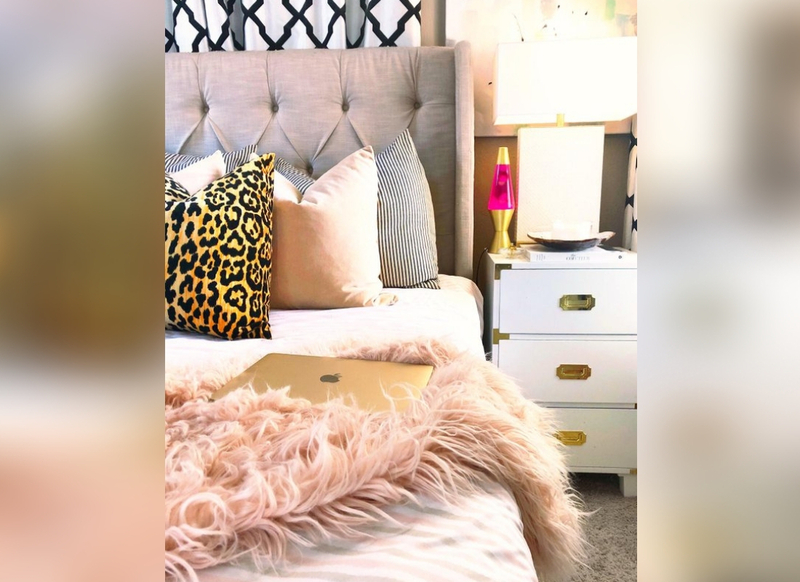 I think the pink and gold lava lamp is the perfect accent for this room, and the furry pink throw and the pink and leopard print pillows just bring everything together. I also love the soft headboard and the gold accents on the bedside table. Although the hues of the colors in this kitchen are rather common in interior design, you don’t often see colors this saturated or this bright in many homes. Bright colors are a great way to amp up a palette and make a room more exciting. 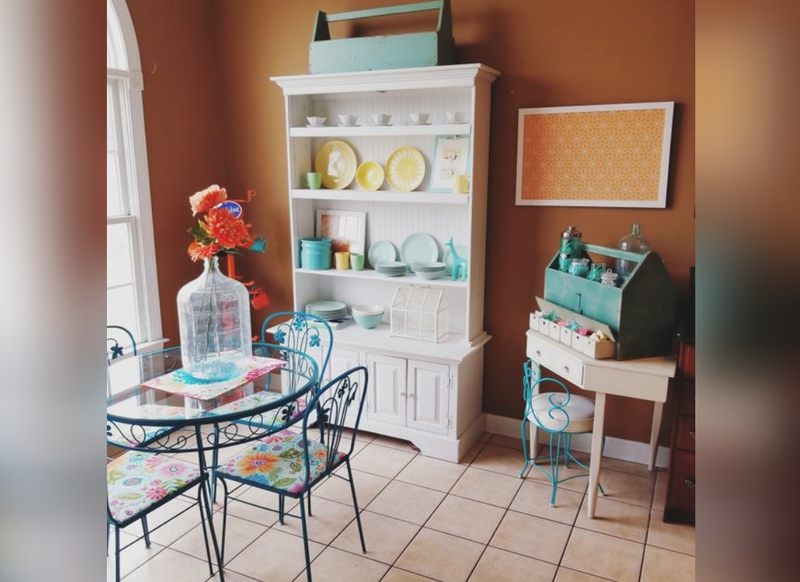 All the colors in this room go very nicely together, and every plate and chair and piece of decor feels intentional. 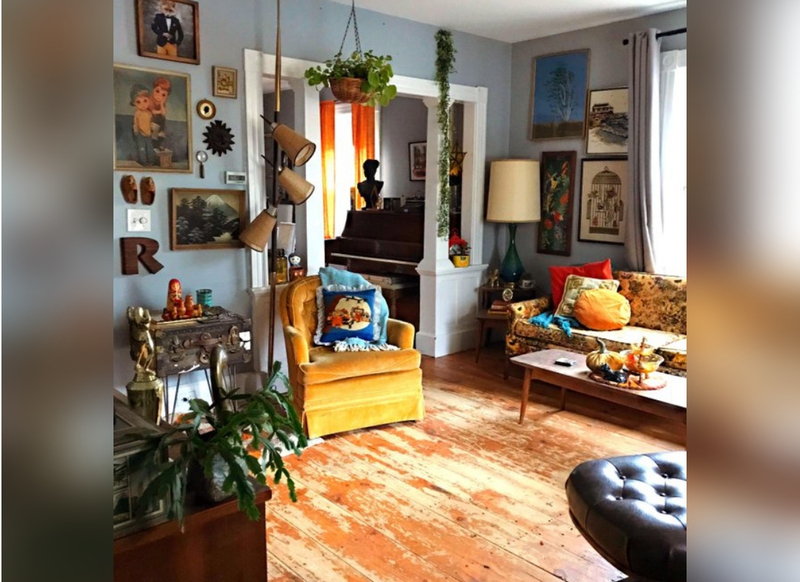 I think the floor is the only thing holding this room back from reaching its full potential, but maybe the homeowner will decide to redo the floor one day. 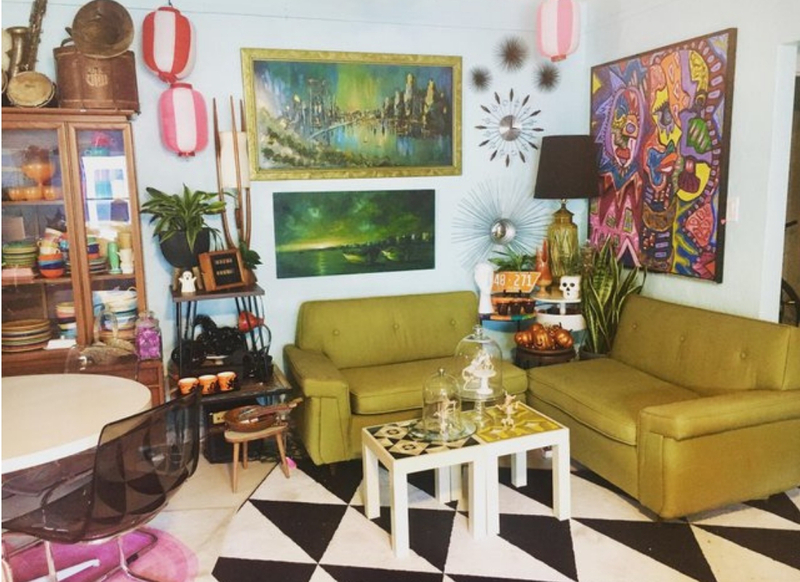 There are so many patterns in this little corner, but all of the patterns connect to one specific theme, so they all work in harmony. 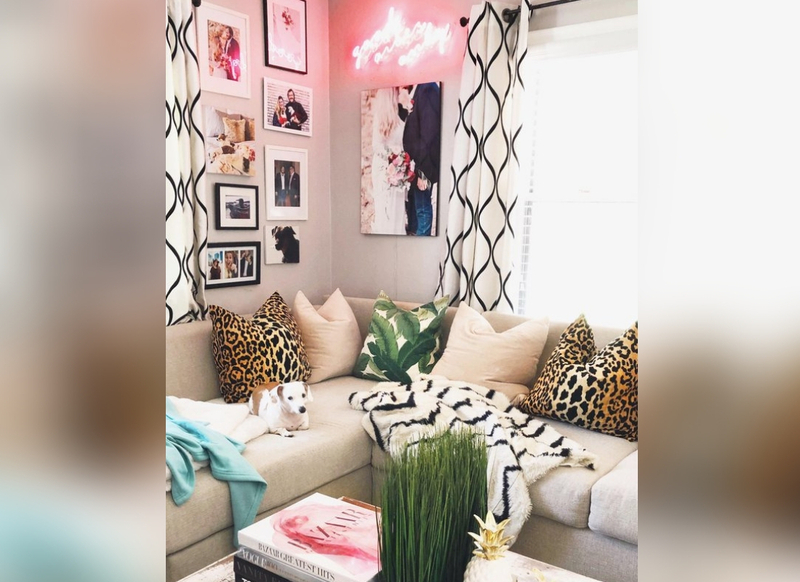 I’d call the theme “wild feminine.” There are some very clear nods to the jungle through the plant and animal prints, but the pink neon sign and soft textures bring us back to a calm, feminine space. That little dog seems to be enjoying himself in the room, and that’s all that really matters. This room is the perfect blend of hard, industrial materials and a warm inviting space. 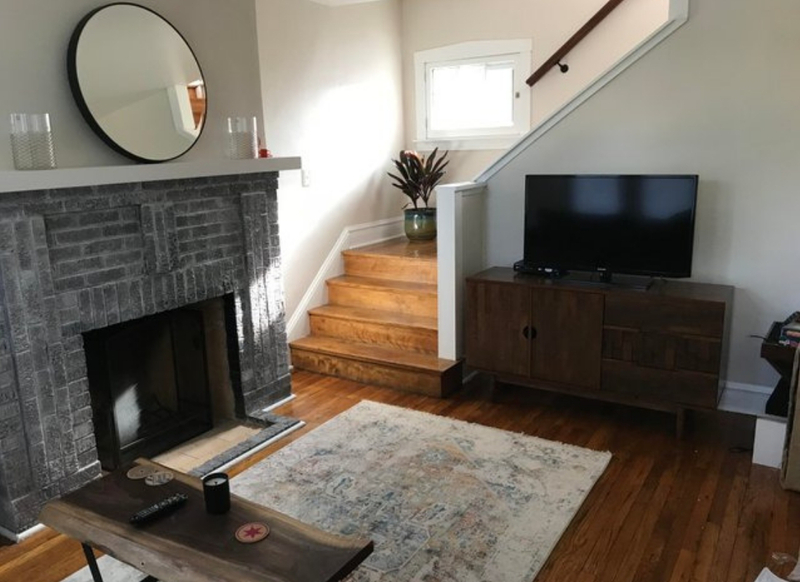 Yes, the stone around the fireplace is cold and harsh, but the warm toned wood adds some nice contrast. This room wouldn’t work nearly as well if the hardwood were grey or cool toned. You need a color that’s going to balance out the cool walls. I love the little plant at the top of the stairs, and that small window is letting in some much needed sunlight. This room is entirely cool toned, which means this small space seems light, chilly, and refreshing. 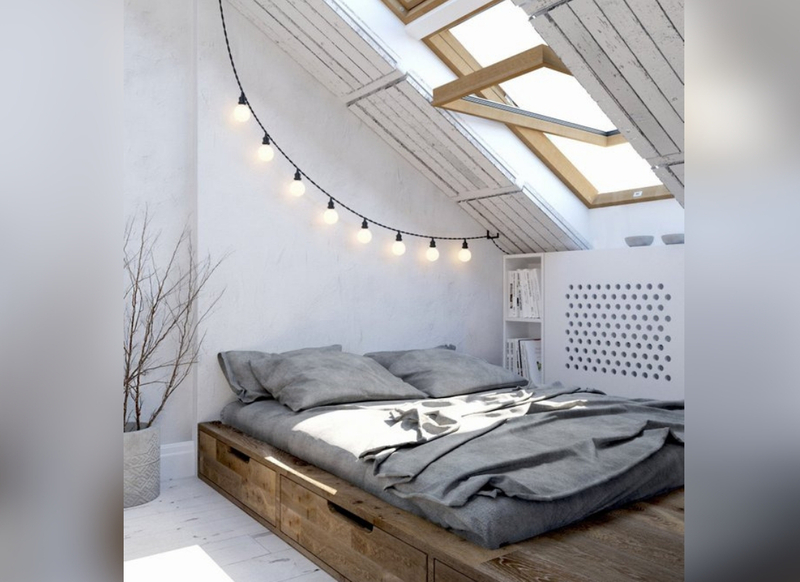 This seems like a loft you could go to to get away from it all— especially when life is stressing you out or you just need a breather. There’s nothing like crisp air and clean sheets to really clear your head. I kind of want to take a long nap in that bed (and by nap I mean I want to lie down and never get up). 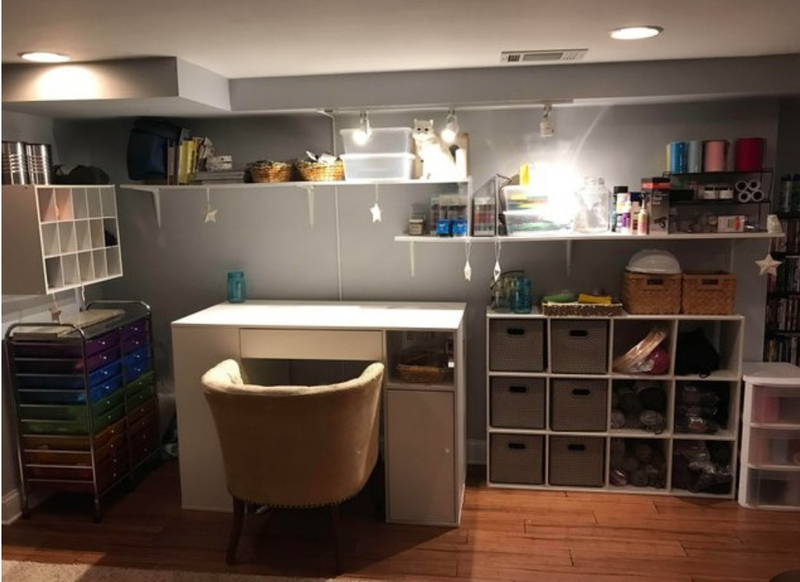 This woman’s husband built her the ultimate crafting space in their basement. Look at all that storage space! Marie Kondo would be proud. This space makes me want to knit a million scarves and sew a million pillowcases. I love crafting, but I don’t have a room like this to make crafts in. Maybe if I did I would make more baskets and knick knacks. I am extremely jealous right now. 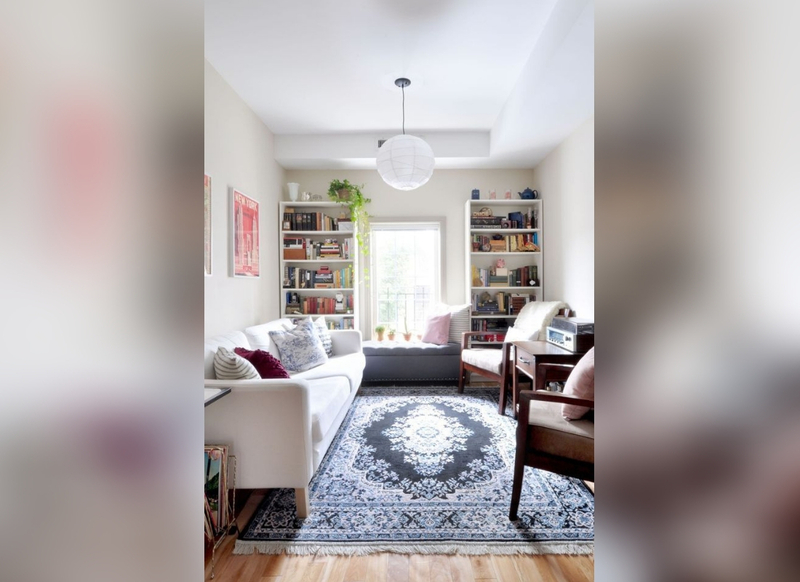 I don’t love a carpeted floor, but if you have a carpeted floor that you can’t get rid of, or if you’re renting a home with a carpeted floor, a great way to combat the problem is by adding a rug on top of the carpet. You’ve probably guessed by now that I love the gallery wall in this room (who doesn’t love a good gallery wall?). Also, when it comes to plants, more is always better. This room is impeccably decorated. I love the symmetrical bookshelves, the patterned rug, the wall art, and the globe light fixture. Everything is built around the window on the far wall. 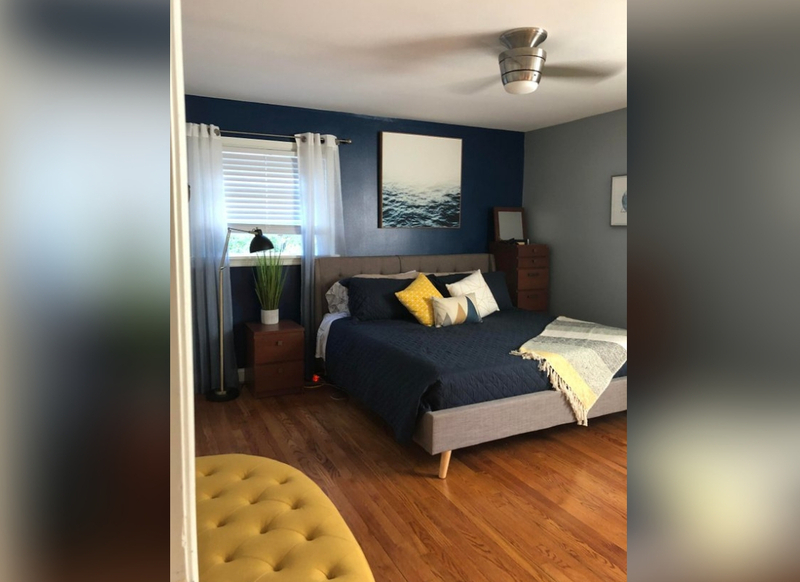 This seems like a great, bright, clean room that would be a perfect place for some light reading on a sunny Sunday afternoon. 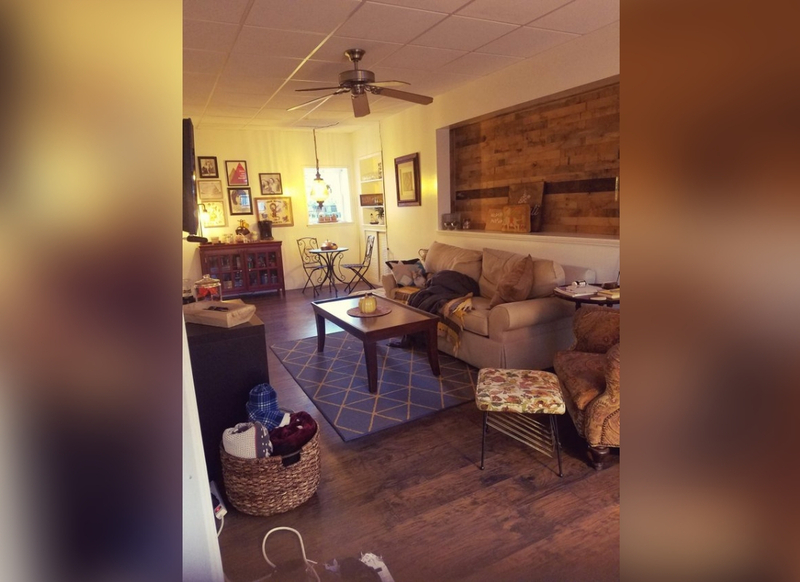 This room is ready to be filled with friends and great conversation. If I’ve learned anything from this design, it’s how important it is to upgrade your light fixtures. This room wouldn’t be nearly as cool without the globe light. Generally, I prefer warm tones over cool tones, but this room is making me fall in love with grey. I think it’s the accent wall behind the bed. 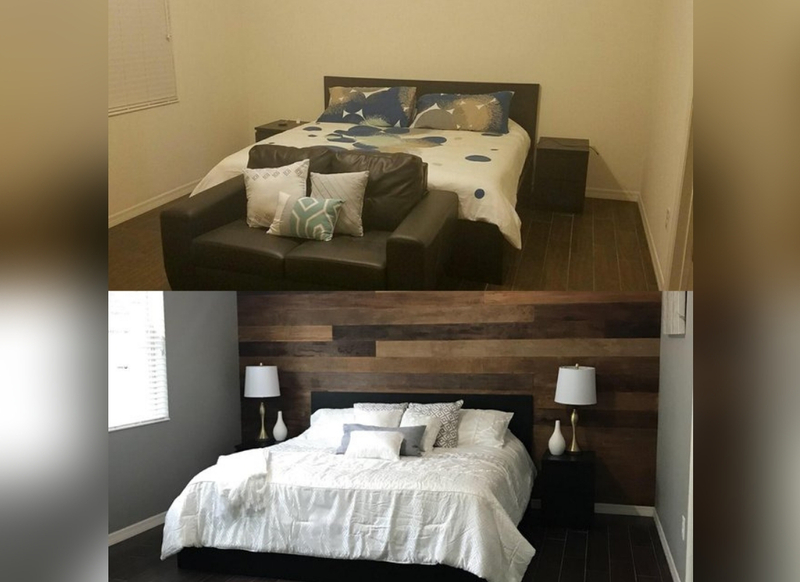 An accent wall really improves any space. Cool-toned rooms often feel bigger than warm-toned rooms, but usually, I’d rather be in a cozy space than a big space. Anyway, if cool tones are your thing, you could take some serious style inspo from this bedroom. 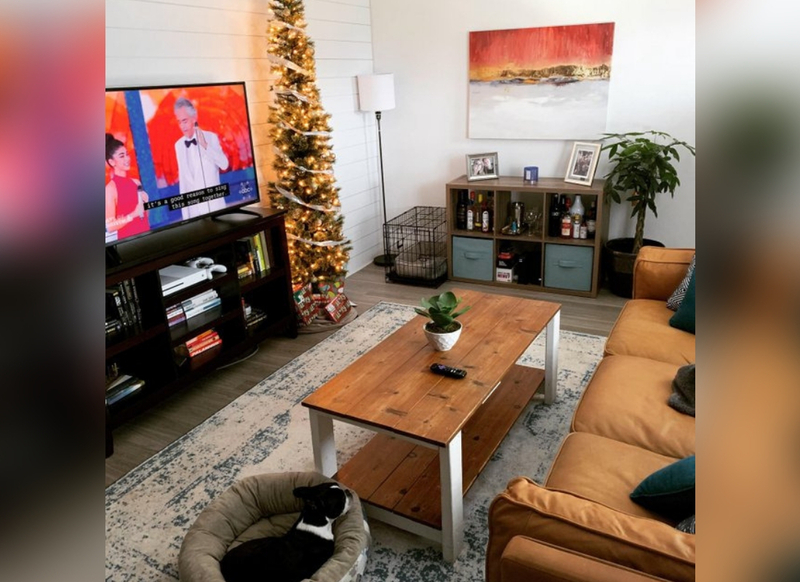 If you’re thinking about adding some color to your living space, but you’re not sure where to start, this room might give you some ideas. Blue and yellow always look great together, but you don’t have to use the brightest tones of blue and yellow. You can go with something more understated like navy and mustard. Throw in some greys and some neutral wood tones and you’ve got the perfect amount of color is your sophisticated space. 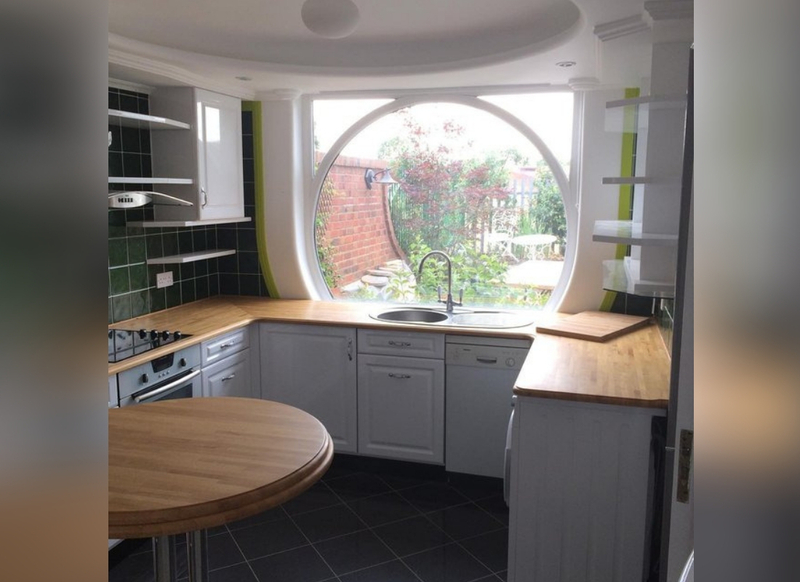 It’s not surprise that this kitchen is in a house in the UK. They just make cute cottages better than we ever could. If you’re thinking about doing a major kitchen remodel, you might be interested in exploring the idea of a window like this. 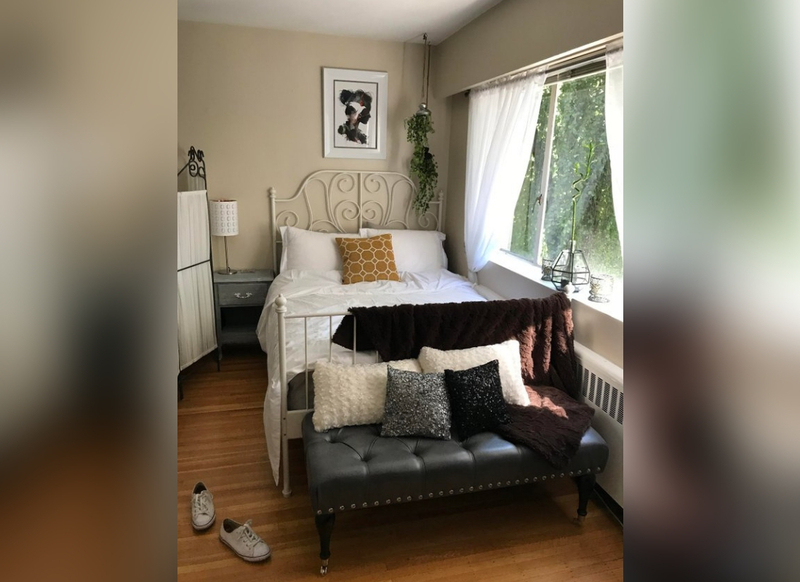 If you’re looking for some low effort projects to spruce up your space, you might want to keep on scrolling. I’m loving the forest green tile backsplash in this kitchen, though. Sometimes all you need is a fresh coat of paint and some new appliances. 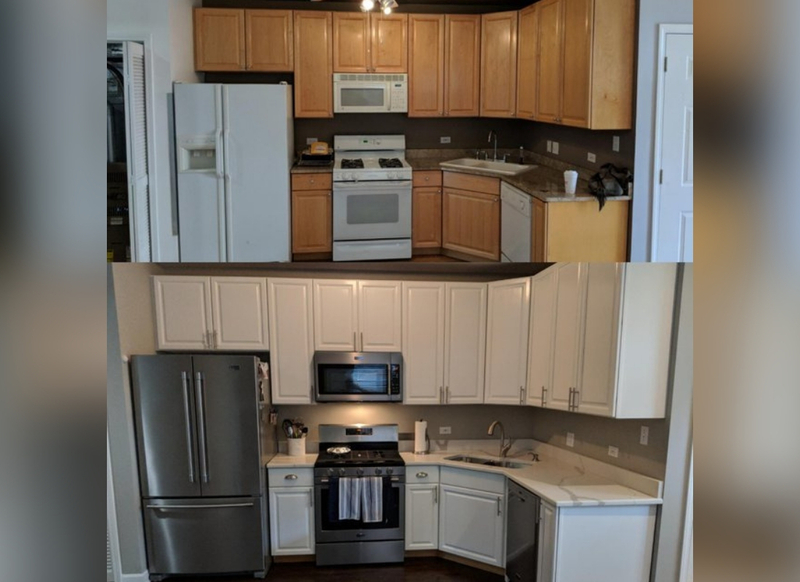 This kitchen was looking pretty drab before an amateur interior designer stepped in and painted all the cabinets white. Now this space looks bigger, brighter, and more inviting. This kitchen inspires me to cook, and if your kitchen doesn’t inspire you to cook, then it’s time to get a new kitchen. Or you could just update your old kitchen. That works fine too. 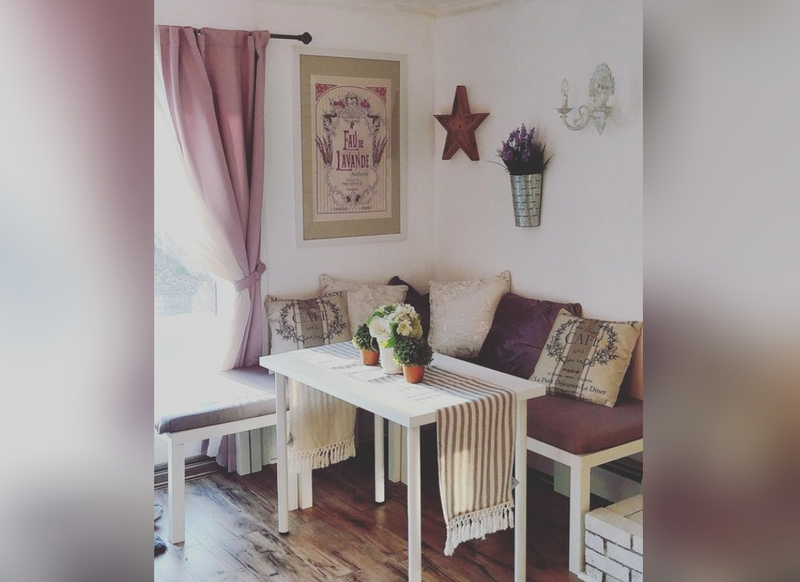 If you want to know how to tell a story with color, look no further than this adorable purple breakfast nook. You can accomplish a look like this one with any color if purple isn’t your thing. Keep your walls, tables, and furniture white, but add colorful accents like cushions, curtains, flowers, framed prints, and other wall art. I think my favorite part of this room is the table runner. You always forget about table runners, but they really do make a room look finished. This bedroom reminds me of a hotel suite with its decorative throw pillows and crisp white linens. This is a great design if you want to feel like you’re on vacation all the time. 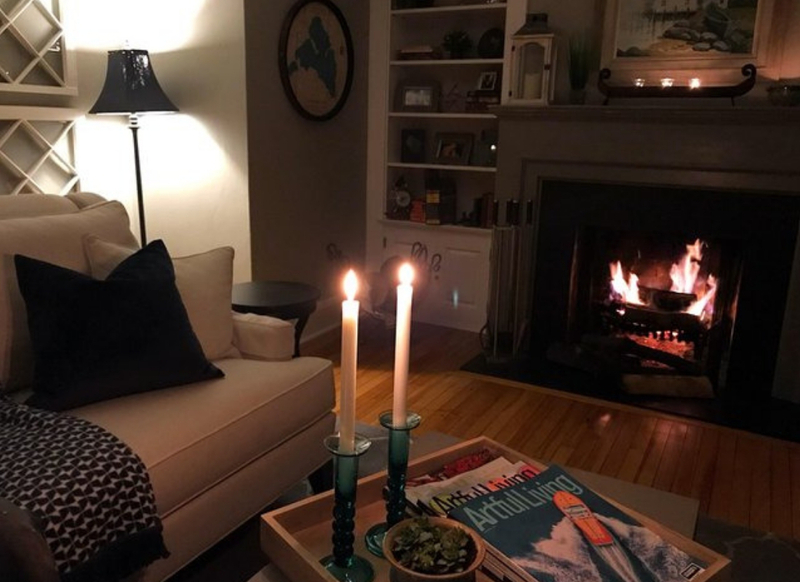 The walls in this room are rather dark, and most of the accents in the room are grey, so this feels like the perfect place to curl up and get cozy on a dark and stormy night. 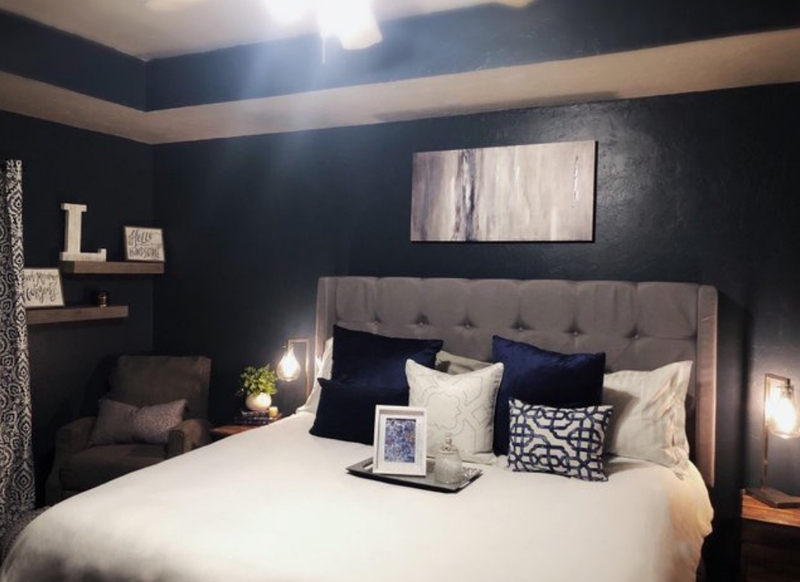 This room has been totally transformed with a fresh coat of paint, some wood paneling, new bedding, and some gorgeous side tables. Never settle for beige walls when you can easily create a space that makes your heart happy. I want to get under those covers and take a nap in that bed so badly. I don’t even want to look at that top “before” picture anymore, though. Thank goodness for renovations. I don’t think I would change anything about this room. Everything is perfectly placed: one mustard pillow, a vintage ottoman, soft curtains, and an open window. All of the elements fit together just perfectly. I just want my room to look exactly like this. Yeah, I’ve seen cooler, more intricate room designs on Pinterest, but this design seems totally attainable. It would be too hard and it would take too much money to achieve this look. I would never think to install a royal blue door, but in this room, it totally works. I think as long as your space isn’t boring, people can appreciate the work that went into designing it. I’d rather live in a house with wacky blue doors than boring white doors. 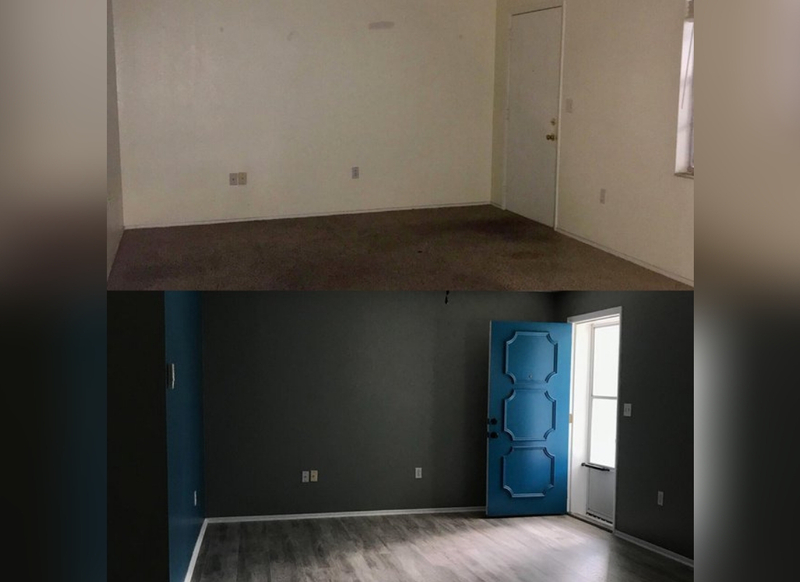 The grey paint brings the room back into the present day, and even though there’s no furniture in this room yet, I can totally see this space’s potential.